Fans of Kathryn and Stuart Immonen have been waiting quite some time for their next graphic novel collaboration: Moving Pictures came out almost five years ago and their other joint projects have been fairly short. Both Immonens have done work for Marvel during their time apart, Kathryn writing Runaways and the acclaimed Journey Into Mystery, Stuart providing art for All-New Captain America and All-New X-Men. Separately, the Immonens are talented and skillful craftspeople. Together, they’re enchanting and fierce. Russian Olive To Red King (AdHouse Books) comes in like the tide, inexorable and inescapable. Intimate to the point of being almost claustrophobic, the book grabs you and drags you under. This is a book that proves graphic novels are just that: novels. While the marriage of the Immonens’ skills is a vital part of the success of Russian Olive To Red King, the plot is such that it could stand alone as prose. The stellar art is the current that drags you to deeper waters after the story has knocked you off your feet. Even if it weren’t an excellent read, the book is a physical delight. It’s heavy and textured with an embossed hardcover. The entire book is matte, which suits it far better than if the pages had been glossy and sleek. Stuart is the kind of artist who knows precisely when to stop drawing in order to evoke whatever emotion he’s aiming at. Pages might appear spartan, but they’re staged carefully and he uses light and shadow deftly, leaving the impression of film noir without any crime or detectives. Everything looks simple and quiet, but that’s part of the trick, and it’s just as necessary a part of the story as the words in the bubbles. It’s difficult to describe the book without spoilers. Kathryn wrote on their blog that “Stuart has called it a romance that isn’t romantic, a ghost story that isn’t frightening. I think we were gunning for ‘psychological romance’ or ‘psychological ghost romance’ or, failing that, ‘book.’” The scope of the story is so strictly defined that it may appear small, but as pages go by specificities fade away, showing that this is a story about emotions just as much as it is about particular people. It would be remarkably easy for Russian Olive To Red King to tip into cloying sentimentality or overexposed tropes. Olive, though she has a job so unique it borders on eccentric, and an apparently irrepressible positive outlook, is far from a Manic Pixie Dream Girl. She proves far more capable in a crisis than Red, whose physical presence and emotional distance would turn him into a very different character in any other book. There’s even a dog, Pasha, but the story embraces a third character that shifts the weight of the story back onto Red in new ways rather than relying on Pasha, or worse yet hurting Pasha, for emotional response from the readers. Bucking those conventions, the Immonens prove to be masters of their respective crafts and their partnership. Brandon Graham’s Prophet dusted off a Rob Liefeld property from the ’90s and used it as the springboard for a sci-fi series that was at atmospheric as it was epic, building a sprawling narrative about intergalactic war with issues that told smaller-scale stories focusing on specific characters in different alien locales. Starting with a more intimate perspective allowed Graham and his artistic collaborators to immerse readers in each environment before diving into the space opera at the center of the plot, and Graham’s newest project begins with a similarly relaxed pace, emphasizing a sense of place and keeping an air of mystery around the larger story details. 8house: Arclight #1 (Image) is the beginning of a new shared fantasy universe conceived by Graham, and while “shared fantasy universe” is a phrase that would normally imply a lot of laborious world-building, this first issue bypasses the exposition and trusts readers to pick up plot details without breaking things down too explicitly. An artist himself (he draws two pages of minicomics in the back of this first issue), Graham understands the value of letting visuals carry most of the storytelling weight, delivering a stripped-down script that lets Marian Churchland’s artwork do the talking. And it speaks volumes. Like the Immonens, Graham and Churchland are a married couple with outstanding creative chemistry, and their first project together is a captivating introduction to a beautiful fantasy world. The cover image essentially sells the book on Churchland’s rich design work, showing an image of the titular character in an ensemble that balances feminine and masculine elements by combining a knight’s armor with a lady’s gown. It’s a very theatrical costume, making for a striking cover image that draws the eye toward it with dramatic fashion. That spectacle is maintained in Churchland’s interior artwork, and the issue opens with a gorgeous two-page splash showing the densely wooded mountains that Arclight and Lady Kinga navigate on their way back home. It’s an incredibly warm, inviting image, and Churchland has a remarkable skill for creating expansive, richly detailed establishing shots that bring a sense of wonder to each new landscape. Her graceful linework and lush painted colors give the book’s visuals a soothing softness, working with Graham’s quiet script to ease the reader into the story, and the nuanced body language and facial expressions of her characters give extra depth to relationships that are lightly touched upon in the actual text. The tree-like Lady Kinga (who shares some design similarities with the tree-like alien Hiyonhoiagn from Graham’s Prophet) is an especially fascinating exercise in character expression, with Churchland using the line of her body and branching face to subtly reflect the character’s emotional state. Wren McDonald brings his love for all things gaming and mech to a story of revenge, justice, and freedom. In a brazen dictatorial landscape, all technology has been confiscated and locked away deep underground in a place called the “Cyber Realm,” by a man known only as “The Master.” The lack of access to machines and computers has set what remains of humanity back decades, creating a vast gap in resources and means; a situation that the Master and his minions use to control and oppress the desperate people. Into this landscape steps Nicolas, a half robot-half man vigilante brought into being by the Cyber Realm itself. Bent upon tearing a path through the Master’s henchmen for a final showdown, Nicolas is seeking revenge for the murder of his son, while also aiming to fulfill his promise to free the machines who bestowed him with power. 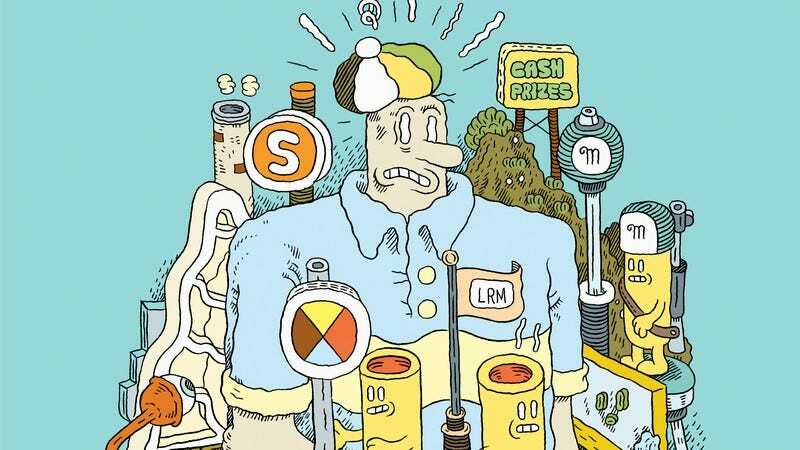 The art in Cyber Realm (Nobrow) is traditionally cartoonish in style, complete with the ruff and scuff, motion lines, exasperated anger, and emotion clouds puffing from people and machines. It looks the way you’d expect the level of a slightly grimy industrial game to look—all these nuts, wires, bolts, and bits lying around. It’s interesting to note how McDonald riffs on the casual violence of video games—decapitations, young children being shot, dismembering—yet the cartoonish rendering nullifies it to some extent, makes it less shocking. Cartooning that is bombastic and expressive in this way, simultaneously maintaining a modicum of sobriety in keeping with meatier leanings, can be a tough line to toe, but McDonald achieves a very capable balance. McDonald regularly mines his passion and interest for gaming into his comics work. Books such as What’s In Brick’s Bag and Heaven’s Dream Town look at, or adapt, specific areas of the medium through a variety of fun and engaging lenses. Cyber Realm has a distinctly more contemporary and salient edge than previous narratives as the game itself conspires to be free from both the Master and Nicolas. The former is the nerd stereotype of old bought to life: curly hair, slim build, and glasses, while Nicolas is representative of the brawny, macho protagonist so often found in gameplay. The Master views his ability with technology as a right to rule and hoard it for himself; Nicolas, on the other hand, exists and acts out at the behest of the game and not beyond.